When the baby food jars are emptied out there are a lot of ways to reuse them. From storage to craft projects baby food jars have all kinds of other uses. 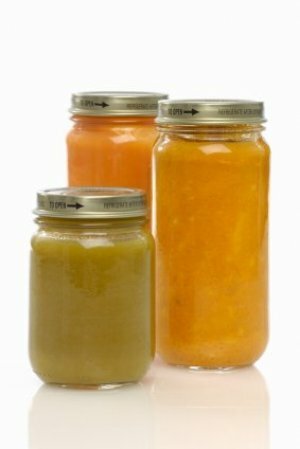 This is a guide about uses for baby food jars. It's great if you have little ones. When they are done eating save the glass jars. You can use them for so many things from keeping small objects in like push pins to nails. You can also use them if you love doing crafts and making your own paints. The bottles make great containers to put them in to use again. Also takes up less space than a bigger container. I love adorable baby jars. I can't throw them away. I am in the process of making a chandelier out of them. Just buy one of those cheap wreaths made out of intwined wood branches that every craft store seems to have an abundance of. Wrap wire around the neck of the jars so its upright and hang from the wreath. Use as few, or as many as you like, even or uneven. Hang the wreath from the ceiling with wire, screw on a hook, stick tea lights in the jars and there you go! 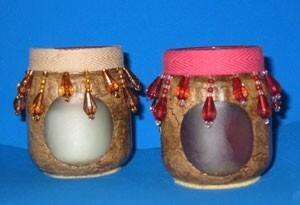 You can decorate the jars however you wish, string beads on the wires, it's all up to your decor. Wondering what to do with baby food jars? Make tea lites! Brush etching cream on jar. No need to do the rim or the bottom. Let sit overnight. Be sure to place the jar on a thick rag or towel to protect your work surface. Doing more than one at a time makes it more worthwhile. Wash dried cream off with soap and warm water. If not totally etched, reapply cream and let sit overnight again. Cut a piece of contact paper to about the size of a half-dollar. Stick on side of jar. Make sure all edges are flat. This is going to be your little window for the light to shine through. Brush on brown paint. Let dry. Brush on crackle medium and let sit 5 minutes. Brush on tan paint. Let dry. Brush on antiquing gel and gently rub off excess. Let dry. Remove the contact paper circle. Spray with clear spray paint. Let dry. Spray another coat and let dry. Cut a piece of felt to fit the bottom of the jar. Glue on. Glue beads around rim of jar overlapping at the end. Be sure to put glue on the end of the tape to keep it from raveling. Put in your tea light and watch it glow! You can see a battery powered lite in the jar on the left. These can be done in other colors as well. Just be sure to put on several coats so the light doesn't shine through. I just like to make my glass look like ceramic. Make sure you spray the clear paint on at least two coats to protect the finish. Make homemade candles with baby food jars. Melt down old candles. Use metal washers for weights tied to toothpicks. Baby food jars have many uses. I saved the ones I used from my son and have used them for a variety of things. I made his food, so I would make little "to go" meals for him and put them in the freezer for when we traveled. Baby food jars are great for storing small nails, screws and other items so that they are easy to see. You can put the jars in a old spice race to keep them together. Does anyone have any ideas for reusing baby food jars? I hate to throw them away, I figure someone has a use for them. I read a lot of ThriftyFun stuff about making items out of recycle-ables, and it worries me a little. Isn't there recycling everywhere? Are people really throwing out glass, plastic and cardboard, etc? Check your local garbage drop-off.....recycling is usually FREE or very cheap. Editor's Note: It is a good point. Although it is a lot easier to recycle now than it was when ThriftyFun was founded, it is still more difficult in many places than others. We look at it finding ways to reuse common things and as free material. Reduce, Reuse, Recycle. Starchild, making items out of recycle-ables IS recycling! It all counts! Unfortunately, there are not recycling facilities in every area of every state. I live in a very rural, low populated area and we are not offered recycling with our trash pick-up, nor are there any collection bins available to us; so, it is up to me to be a more responsible consumer and not buy unnecessary items. I first decorate the jars with glass paints (purchased at your local hobby store) and give each one a beautiful pattern. They look great on the window sill with sunlight shining throuh the painted glass. I then use them for either storage of small misc. items like hair clips, screws, or spices, or place a tea candle in them. Hope that helps you. WE MADE PAPERWEIGHTS FILLING THE JARS WITH COLORED SAND IN LAYERS,ALSO FILLED WITH WATER AND SMALL PLASTIC FISH, OR COLORED MARBLES, A PRETTY ARTIFICIAL FLOWER,AND ALSO A SMALL SNAPSHOT OF A CHILD FITTED INSIDE THEN FILLED WITH SAND.THESE SOLD WELL AT OUR PRESCHOOL FUND RAISER.SEAL THE TOPS WELL AND DECORATE THEM WITH BITS OF RIBBON OR CLOTH OR PAINT THEM. MAYBE THIS HELPS YOU. ALSO AS A GRANDMOTHER MYSELF SEVERAL TIMES OVER,I'VE HELPED THE KIDS MAKE THESE AS GIFTS. I use mine to store loose herbs. I have found that the spices found in the Mexican section of the grocery store (that come in cellophane) are much cheaper than regular spices and I use the jars to store these in. I use them for cheap mosquito repellent holders. The huge citronella candles always cost a pretty penny, so I buy a large bag of small citronella candles and put place them inside glass baby food jars, jam jars, etc. They look beautiful outside at night, and the glass also protects small children from the flame. My mum and grandma make lemon butter and other jams etc that they put into small jars to give away as gifts or they donate their jams etc to the church. I have used baby food jars for mini-snowglobes. you can buy mini ornaments for almost any holiday . glue the ornaments to the inside of the lid, let dry, put water in the jar with a few drops of glycerine, and some glitter. Put the lid back on, turn over, and you have a snowglobe. 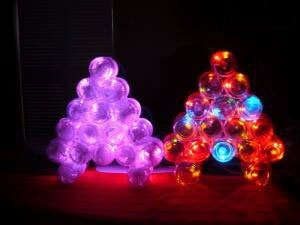 they can also be used for sand art and for mini-candle jars, if you make candles. cover the lid with a circle of fabric and yarn or ribbon and you have a nice little gift or favor. A group of children can make homemade butter in baby food jars. Fill the baby food jar under the rim of the jar with heavy whipping cream; give to the children and have them shake it, taking turns until the whipping cream becomes thick and creamy; refrigerate. You can add a dash of salt to the homemade butter and stir or leave it plain; it is delicious on homemade hot biscuits or homemade bread or even toast! The children love shaking the baby food jars. Make sure they hold the lid down! I have made votive, or tea light holders with them. Just mix two parts craft glue with 1 part water, paint the jar with the glue mixture, then roll the jar in sparkles, rhinestones, or any decoration you like! Watch out for a BPA coating on the inside of the jar lids (and other products containing plastic). BPA has been linked to developmental issues in fetuses, infants, children and health issues in adults. Also keep an eye out for it in soothers, bottles, toys, drinking containers and other plastic products. How can I make souvenirs for a boy's first birthday out of baby food jars? Ideas for souvenirs for a 1st party for a boy using baby food jars. I would make a "label" on the computer, putting the birthday boy's picture on it (in the middle like the Gerber baby); then putting treats such as candies (homemade or purchased) inside. I would try to link the "name" on the label with the contents, such as "Pete's Peas" and use green jelly beans, or "Aubrey's Apples", whatever. How about search and find jars? Might be a little old for 1 yr olds, but could also work. You could put in things more age appropriate. I hope that helps, or at least you could do it in the next couple of years. My niece made snowglobes out of babyfood jars with her Girl Scout troop. Fill clean jars with water. Water can be tinted with food coloring if desired. Add glitter into the water (for the "snow"). Spraypaint the lids gold or silver or whatever color you like. Then hot glue small figurines or objects onto the inside of each lid, such as a tiny trees, animals, people, etc. Hot glue and screw on the lids (with the figures now inside) tightly. Let dry thoroughly. Hot glue ribbon around the edge of the lids if desired. Turn babyfood jars over and shake -- and watch the glitter swirl in the water like snow -- and you have snow globes! If any jars leak water, try to remove the lids and re-glue. You can also put loose items into the jar with the water and glitter -- such as colored beads and metallic confetti cutouts -- that will float (and not disintegrate) and look pretty when the jar is shaken. NOTE: Because Liquid Nails Adhesive is used as glue, each row of jars must dry overnight before next row is added. Project will take a number of days to complete. Prepare the jars. Wash and dry all jars and lids. Drill the holes. Before drilling holes in lids for the bulbs to fit into, drill practice holes in a board to determine appropriate bit size. Bulbs should fit snugly into holes. Drill holes in the center of all 33 lids. Place tinsel in all jars and replace lids. Glue the jars. Line up 7 jars with caps up next to each other along a straight edge on a flat surface. Use Liquid Nails to glue jars together. Tie string around the row of jars to hold them in place. Let dry over night. Turn glued jars on side. Glue a row of six jars on top of the 7 jars. Let dry overnight. Continue to glue a row each day until the last jar becomes the top of the tree. Make the tree trunk in the same way. Assemble the tree. Glue tree trunk to the finished board. Let dry overnight. Glue large section of the tree onto the trunk. Let dry overnight. To attach ribbon to tree, start at top of tree trunk and apply double-sided tape around tree, ending on the opposite side of tree trunk. Place the ribbon over tape. Insert the lights. Starting at the top, insert a light in each hole. Set the completed tree in a location of your choice, plug it in and light up! In your garage or basement, you can nail/screw the lids to the undersides of your shelving, then put nails, screws, and other small fasteners in the jars and screw them onto the jar lids. Baby food jars are a good size for this, but you can also use larger jars. This provides a free, convenient, see-through way to organize. I was reading a book on Home Freezing this weekend. It talked about using baby food jars to freeze fresh herbs in. Pack fresh herbs tightly in the jars. Put lid on. Boil in water for 5 minutes. Cool and freeze. Take out what you need when you need it. For my daughter's first birthday party, I made her into the "Gerber" baby by creating new "labels" for the jars. I started with a Word document and inserted a picture of her from my Kodak files, then shrunk the picture down to the size needed to fit the baby food jars. After that, to the left of the picture I typed "ingredients" to include mom, dad, grandparents, and added aunts, uncles, cousins, etc. On the right side of the picture I typed her birth statistics and her height/weight a year later. I even inserted lines and bars to make her very own "barcode" with the numbers of her birthdate under each bar. I copied and pasted 6 or 7 to a page, cut them out, then glued them to the baby food jar. I filled them with M & Ms, Skittles, and cereal to give as gifts at her birthday party, and for table decorations.